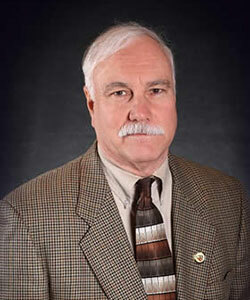 Dr. Ric Peigler is a Professor of Biology at UIW, where he has worked since 1998. He received his B.S. in 1973 in Horticulture from Clemson University, his M.A. in 1975 in Agricultural Education from Clemson, and he earned his Ph.D. in 1983 in Entomology from Texas A&M University. His home state is South Carolina. Dr. Peigler teaches Diversity of Life, Entomology, Evolution & Systematics, and Human Evolution. He worked as Collections Manager and Curator of Entomology at the Denver Museum of Natural History from 1990 until 1997. He has presented invitational lectures on wild silkmoths in Australia, India, China, Madagascar, and Japan. Dr. Peigler's research interests focus primarily on taxonomy, phylogeny, and biology of wild silkmoths (Family Saturniidae) of the world, particularly ones from eastern Asia. His studies deal with ecology, parasitoids, and host plants of wild silkmoths. He collaborated several years ago with colleagues at the University of Maryland on the molecular genetics of Saturniidae and Lasiocampidae, and recently with colleagues at University of Hawaii on molecular genetics and genomics of Saturniidae. Dr. Peigler has published more than 50 articles dealing with moths in scholarly journals; several popular-level articles on moths, sericulture, horticulture, and classic entomological literature; three books and one book chapter. Miranda, Robert A. & R. S. Peigler. 2007. Phylogenetic analysis of the Saturnia-group (Saturniidae) of genera based on scolus structure of mature larvae. Transactions of the Lepidopterological Society of Japan 58(4): 433-441. Burke, Joel T. & R. S. Peigler. 2009. Phylogenetic analysis of Anisota (Insecta: Lepidoptera: Saturniidae) based on scolus size and structure of mature larvae. Southeastern Naturalist 8(4): 739-745. Balboa, Alejandro A. & R. S. Peigler. 2011. Artificial hybridization between Anisota finlaysoni from Ontario and Anisota discolor from Texas (Lepidoptera: Saturniidae). The European Entomologist 3(3): 121-131. Steele, Trevor J. & R. S. Peigler. 2015. Biology of four species of Hemileuca (Saturniidae) in Texas with special reference to their parasitoids. Lepidoptera Science 66(1): 1-7. Louwagie, Joseph H., III & R. S. Peigler. 2016. Biology and chemical ecology of Eupackardia calleta (Saturniidae) in southern Texas. Lepidoptera Science 67(2): 58-66. Dupuis, J. R., R. S. Peigler, S. M. Geib & D. Rubinoff. 2019. Phylogenomics supportsincongruence between ecological specialization and taxonomy in a charismatic clade of buck moths. Molecular Ecology: in press. Peigler, R. S. & Rolf G. Oberprieler. 2017. Ethnographic description of cocoons and silk of the moth families Saturniidae, Lasiocampidae and Psychidae. Nachrichten des Entomologischen Vereins Apollo 38(2/3): 113-120. Peigler, R. S. & Stefan Naumann. 2016. What exactly is Antheraea paphia (Linnaeus, 1758)? Atalanta 47(3/4): 500-520. Peigler, R. S. 2016. Field observations of Agapema dyari Cockerell, 1914 (Lepidoptera: Saturniidae) in western Texas. Nachrichten des Entomologischen Vereins Apollo 37(2/3): 69-72. Naumann, Stefan, R. S. Peigler & Swen Löffler. 2014. A new species of Samia Hübner, 1819 (“1816”) (Lepidoptera: Saturniidae) from Vietnam, with taxonomic updates for the genus. The European Entomologist 5(4): 101-115. Peigler, R. S. & John V. Calhoun. 2013. Correct authorship of the name Phalaena ricini and the nomenclatural status of the name Saturnia canningi (Lepidoptera: Saturniidae). Tropical Lepidoptera Research 23(1): 39-43. Naumann, Stefan & R. S. Peigler. 2012. A new species of Attacus (Lepidoptera: Saturniidae) from Selayar Island, Indonesia. Nachrichten des Entomologischen Vereins Apollo 33(1): 45-48. Peigler, R. S. 2012. Diverse evidence that Antheraea pernyi (Lepidoptera: Saturniidae) is entirely of sericultural origin. Tropical Lepidoptera Research 22(2): 93-99. R. S. Peigler. 1976. Observations on host plant relationships and larval nutrition in Callosamia (Saturniidae). Journal of the Lepidopterists' Society 30(3): 184-187. R. S. Peigler. 1977. Hybridization of Callosamia (Saturniidae). Journal of the Lepidopterists' Society 31(1): 23-34. R. O. Kendall & R. S. Peigler. 1981. Hemileuca grotei (Saturniidae): its morphology, natural history, spacial and temporal distribution. Journal of the Lepidopterists' Society 35(1): 41-50. R. S. Peigler. 1981. Demonstration of reproductive isolating mechanisms in Callosamia (Saturniidae) by artificial hybridization. The Journal of Research on the Lepidoptera 19(2): 72-81. J. C. E. Riotte & R. S. Peigler. 1981. A revision of the American genus Anisota (Saturniidae). The Journal of Research on the Lepidoptera 19(3): 101-180. R. S. Peigler & S. B. Vinson. 1984. Temporal distribution of species of Schinia flying in Brazos County, Texas. The Southwestern Entomologist 9(1): 48-51. R. S. Peigler. 1985. Zwei neue Arten der Gattung Attacus (Lepidoptera, Saturniidae). Nachrichten des Entomologischen Vereins Apollo (Frankfurt) 6(2): 53-60. R. S. Peigler. 1985. Description, distribution, and biology of a new Hemileuca (Lepidoptera: Saturniidae) from western Texas and southern New Mexico. Nachrichten des Entomologischen Vereins Apollo (Frankfurt) 6(2): 113-124. R. S. Peigler. 1986. Worldwide predilection of resiniferous hostplants by three unrelated groups of moths in the genera Actias, Citheronia (Saturniidae) and subfamily Euteliinae (Noctuidae). Transactions of the Lepidopterological Society of Japan 37(1): 45-50. R. S. Peigler. 1988. A review of pollination of Magnolia by beetles, with a collecting survey made in the Carolinas. Journal of the Magnolia Society 45: 1-8. R. S. Peigler & S. B. Vinson. Parasitoid and hostplant records for genus Schinia (Noctuidae) in Texas. Journal of the Lepidopterists' Society 42(2): 144-145. R. S. Peigler & S. E. Stone. 1989. Taxonomic and biological notes on the Hemileuca maia complex (Saturniidae) with description of a new species from Texas and New Mexico. Transactions of the Lepidopterological Society of Japan 40(2): 149-166. R. S. Peigler. 1992. The identity of Samia cynthia and the status of its introduced populations. Wild Silkmoths '91: 164-178. R. S. Peigler. 1993. Megamoths. Wyoming Wildlife 57(8): 20-25. R. S. Peigler. 1993. A defense of Ailanthus. American Horticulturist 72(2): 38-43. R. S. Peigler. 1993. Cladistic analysis of the genera of the subfamily Arsenurinae (Saturniidae). Journal of the Lepidopterists' Society 47(3): 211-228. R. S. Peigler. 1993. Wild silks of the world. American Entomologist 39(3): 151-161. R. S. Peigler & R. O. Kendall. 1993. A review of the genus Agapema (Lepidoptera: Saturniidae). Proceedings of the Denver Museum of Natural History, Series 3, Number 3: 1-22. K. Veenakumari, P. Mohanraj & R. S. Peigler. 1995. Life history of Attacus mcmulleni (Saturniidae) from the Andaman Islands, India. The Journal of Research on the Lepidoptera 31(3-4): 169-179. R. S. Peigler. 1996. Catalog of parasitoids of Saturniidae of the world. The Journal of Research on the Lepidoptera 33: 1-121. T. P. Friedlander, K. R. Horst, J. C. Regier, C. Mitter, R. S. Peigler & Q. Q. Fang. 1998. Two nuclear genes yield concordant relationships within Attacini (Lepidoptera: Saturniidae). Molecular Phylogenetics and Evolution 9(1): 131-140. J. C. Regier, Q. Q. Fang, C. Mitter, R. S. Peigler, T. P. Friedlander & M. Alma Solis. 1998. Evolution and phylogenetic utility of the period gene in Lepidoptera. Molecular Biology and Evolution 15(9): 1171-1182. R. S. Peigler. 1999. Taxonomy, distribution, and sericultural potential of the American species of Antheraea (Saturniidae). Bulletin of the Indian Academy of Sericulture 3(1): 1-9. Colleen N. Ramos & R. S. Peigler. 1999. Comparative ultrastructure of silk fibers for identifying silk textiles. International Journal of Wild Silkmoth & Silk 4: 17-29. R. S. Peigler & E. W. Classey. 2000. Seitz' Macrolepidoptera of the World: perspectives from a taxonomist and a publisher. News of the Lepidopterists' Society 42(3): 93-95, 108-109. J. C. Regier, C. Mitter, R. S. Peigler & T. P. Friedlander. 2000. Phylogenetic relationships in Lasiocampidae (Lepidoptera): initial evidence from elongation factor-1alpha sequences. Insect Systematics & Evolution 31(2): 179-186. J. C. Regier, C. Mitter, T. P. Friedlander & R. S. Peigler. 2001. Phylogenetic relationships in Sphingidae (Insecta: Lepidoptera): initial evidence from two nuclear genes. Molecular Phylogenetics and Evolution 20(2): 311-325. Peigler, R. S. & Jane W. Baird. 2001. Preliminary experiments to spin silks of seven species of Saturniidae from North America. International Journal of Wild Silkmoth & Silk 6: 1-6. S. Naumann & R. S. Peigler. 2001. Four new species of the silkmoth genus Samia (Lepidoptera: Saturniidae). Nachrichten des Entomologischen Vereins Apollo (Frankfurt) 22(2): 75-83. J. C. Regier, C. Mitter, R. S. Peigler & T. P. Friedlander. 2002. Monophyly, composition, and relationships within Saturniinae (Lepidoptera: Saturniidae): evidence from two nuclear genes. Insect Systematics & Evolution 33(1): 9-21. Peigler, R. S. 2002. Lectotype designation of Attacus caesar (Maassen 1873) (Saturniidae). Revista de Revista de Lepidopterologia 30: 311-313. Peigler, R.S. & K.L. Wolfe 2004. Rediscovery of Anisota leucostygma (Boisduval, 1872), description of its immature stages, and notes on the genus Anisota Hübner,  in Mexico (Lepidoptera: Saturniidae). Revista de Lepidopterologia 32 (125): 5-12. R. S. Peigler. 2004. Discovery and publication of unpublished manuscript pages on African Noctuidae (Lepidoptera) by Max Gaede (1871-1946) / Entdeckung und Publikation bisher unbekannter Manuskriptseiten über afrikanische Noctuidae (Lepidoptera) von Max Gaede (1871-1946). Galathea (Nürnberg), Suppl. 15: 23-30. Regier, J. C., U. Paukstadt, Laela H. Paukstadt, C. Mitter & R. S. Peigler. 2005. Phylogenetics of eggshell morphogenesis in Antheraea (Lepidoptera: Saturniidae): unique origin and repeated reduction of the aeropyle crown. Systematic Biology 54(2): 254-267. Veenakumari, K., P. Mohanraj & R. S. Peigler. 2005. Life history of Actias ignescens (Lepidoptera, Saturniidae) reared on its natural host plant, Crypteronia paniculata, on South Andaman Island. Transactions of the Lepidopterological Society of Japan 56(3): 184-192. R. S. Peigler & Merced Maldonado. 2005. Uses of cocoons of Eupackardia calleta and Rothschildia cincta (Lepidoptera: Saturniidae) by Yaqui Indians in Arizona and Mexico. Nachrichten des Entomologischen Vereins Apollo 26(3): 111-119. Ylla, J., R. S. Peigler & Akito Y. Kawahara. 2005. Cladistic analysis of moon moths using morphology, molecules, and behavior: Actias Leach, 1815; Argema Wallengren, 1858; Graellsia Grote, 1896 (Lepidoptera: Saturniidae). Revista de Lepidopterologia (Madrid) 33(131): 299-317. Regier, J.C., Grant, M.C., Mitter, C., Cook, C.P., Peigler, R.S., Rougerie, R. 2008. Phylogenetic relationships of wild silkmoths (Lepidoptera: Saturniidae) inferred from four protein-coding nuclear genes. Systematic Entomology 33: 219-228. Burke, Joel T. & R. S. Peigler. 2009. Phylogenetic analysis of Anisota (Insecta: Lepidoptera: Saturniidae) based on scolus size and structure of mature larvae. Southeastern Naturalist 8: 739-745. Balboa, Alejandro A. and Peigler, R.S. 2011. Artificial hybridization between Anisota finlaysoni from Ontario and Anisota discolor from Texas (Lepidoptera: Saturniidae). The European Entomologist 3: 121-131. R. S. Peigler. 1989. A Revision of the Indo-Australian Genus Attacus. The Lepidoptera Research Foundation, Beverly Hills, California. xi + 167 pp. R. S. Peigler & H. Y. Wang. 1996. Saturniid Moths of Southeastern Asia. Taiwan Museum, Taipei. 265 pp. R. S. Peigler. 1996. Foreword, pp. xi-xix in the book: Wings of Paradise: the Great Saturniid Moths, by John Cody. University of North Carolina Press, Chapel Hill. 163 pp. R. S. Peigler. 1997. Prólogo, pp. 9-10 in the book: Observar Mariposas, by A. Masó & M. Pijoan. Editorial Planeta, Barcelona. 320 pp. R. S. Peigler. 2004. The Silkmoths of Madagascar, Chapter 10, in Unwrapping the Textile Traditions of Madagascar. Field Museum of Natural History, Chicago/UCLA Fowler Museum. 196 pp. R. S. Peigler & S. Naumann. 2003. A Revision of the Silkmoth Genus Samia. University of the Incarnate Word, San Antonio. 288 pages, 16 color plates, 10 maps.